Childhood lead poisoning is the most common environmental disease of young children. 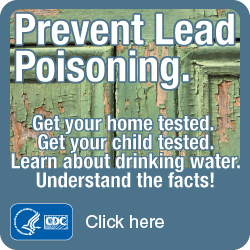 Childhood lead poisoning is TOTALLY PREVENTABLE. While preventable, the effects of lead poisoning are IRREVERSIBLE. Many children show no symptoms when they have been exposed to lead. Some symptoms like headaches, stomachache, and crankiness are often associated with other common diseases. Lead poisoning causes reduced intelligence, low attention span, reading and learning disabilities, and has been linked to juvenile delinquency, behavioral problems, and many other adverse health effects. High levels of lead can cause coma, convulsions, and death. Lead enters the body either by ingestion (swallowing) or inhalation (breathing it in). Lead is not absorbed through the skin. The majority of children poisoned by lead live in homes built and/or painted prior to 1978. These homes contain lead paint, which was outlawed in 1978. As lead paint deteriorates, it creates lead dust. A young child may get lead in their system through inhalation of this dust or through ingestion of the lead dust that settles on the surfaces in their environment (toys, floor, window sills, clothing, etc.) when they put things in their mouth or fail to wash their hands before eating. Lead paint chips can also taste sweet and some children develop a habit of eating them. Lead can also be introduced into a child’s environment on the clothes of an adult that works in certain businesses such as the steel industry, battery factory, construction, painters, plumbers, and welders), or uses lead in a hobby such as hunting, fishing, pottery, and jewelry making. Lead can also be found in imported or glazed ceramics, painted antique items, drinking water, and contaminated soil. Lead in soil is usually the result of lead paint from the exterior surfaces of homes painted with lead paint prior to 1978. When are children most at risk for lead poisoning? Data indicates children six years and younger are at the greatest risk for lead poisoning due to both age-related behavior and brain development. If you answer YES to ANY of the following AT RISK questions your child is more likely to have an elevated blood lead level. Does your child live in or regularly visit a house or child care center built before 1978? Does your child have a sibling or playmate who has an elevated blood lead level? Does your child frequently come in contact with a person who works in an industry using lead, such as a battery factory, smelter or a radiator shop? Does your child frequently come in contact with a person who has has a hobby that uses lead, such as stained glass, fishing or reloading ammunition? Is your child a recent immigrant from a country where the use of lead in consumer products is not restricted? Is your child a member of a minority group? Is your child enrolled in Hoosier Healthwise (Medicaid)? Do you give your child traditional remedies that may contain lead, such as Arzacon or Greta? Have you exposed your child to traditional cosmetics that may contain lead such as kohl? Why is it important to test a child for lead poisoning? In the majority of lead poisoning cases, there are no physical symptoms even though damage is being done to the body. Therefore, the only method to determine lead exposure is a blood lead test. Your doctor or the health department laboratory can do this for you. Children ages six years and younger should have an annual blood lead test. Ask your pediatrician to have your child tested or call the Vanderburgh County Health Department to schedule a free blood lead test. To schedule an appointment at the Health Department, and for more information, Call (812)435-5568. This program is funded by US Department of Housing & Urban Development (HUD) through Indiana Housing & Community Development Authority (IHCDA). The program is designed to correct areas of the home, both interior, exterior and ground soil that may have the presence of lead-based paint. For more information or to apply for the program contact Tehiji Crenshaw at (812)492-3951.